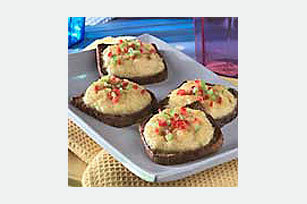 Cocktail pumpernickel bread is spread with a cheesy crab topping and broiled for a delicious open-faced appetizer or snack. Preheat broiler to high heat. Mix all ingredients except toast slices; spread evenly onto toast slices. Broil until lightly browned. Garnish each appetizer with 1 tsp. each red pepper and green onion. Canned crabmeat may contain tiny pieces of shell, so use your fingers to pick over the crabmeat before adding to a recipe.